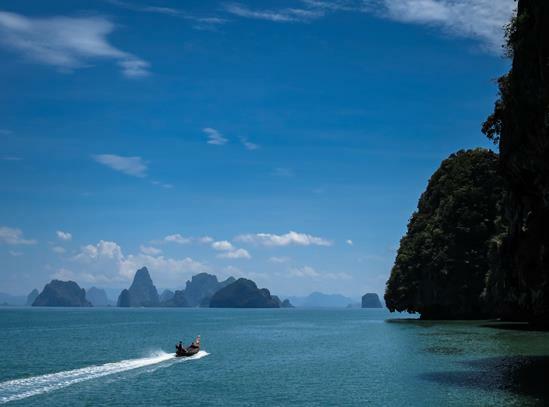 Set on a peninsula surrounded by the blue waters of the Andaman Sea with far reaching views out to the stunning UNESCO protected Phang Nga Bay, Point Yamu was opened last year by one of my favourite small hotel brands, COMO. It’s their second opening in Thailand and is sister to their rather cool and understated Metropolitan Hotel in Bangkok (note to self - a great combination). Arriving at the resort, some people may frown at the exterior - less Thai and more boxy grey with a mesh like covering. But hold your comments until you walk up the stairs to the open air lobby and I’ll challenge you not to be wowed. The enormous centrepiece, styled on a Thai altar, is adorned with silver bowels of brightly coloured flowers, local artefacts and temple bells that tinkle as the sea breeze wafts through. Above lacy lanterns made from lobster nets dangle from the roof. It's here that you’ll get your first glimpse of the mesmerising views. The decor, by Italian designer Paola Navone, is impeccable - stylish but relaxed. There’s a definite nod to the hotel’s surroundings, both natural and cultural; lots of white and blue with splashes of turquoise (to reflect the ocean) and orange painted columns (reminiscent of the saffron robes of the local monks). Playful touches abound like a row of chubby, smiling Buddha’s, a “fish pond” installation with cardboard fish hanging over tin trays and a large mudra on the door to the stunning pearlescent private dining room. My light and airy suite had me dancing round a bit, from the dreamy bedroom to the lounge with squidgy sofa, to the stunning bathroom full of the signature Como Shambhala range of lotions and potions, and finally the expansive balcony with to-die-for views of the sweeping Cape Yamu Bay; a view which each morning at sunrise I would sit and watch as the fishermen started their day. All the rooms and suites come with the same serene interiors and ocean views. It’s the size and location that improves as you move up (albeit some entry level rooms don’t have balconies). Then come the private pools which are not just the sort to dip your toe in, no, these you can actually swim in. There are also one, two and three bedroom villas (ideal for families) which have the most unforgettable views - an amazing expanse of blue first from the infinity pool and then the ocean. The reason I love COMO hotels and resorts is that they do certain things very well, and believe me, Point Yamu is no exception. The service is spot on with warm, personable and ever smiling staff. 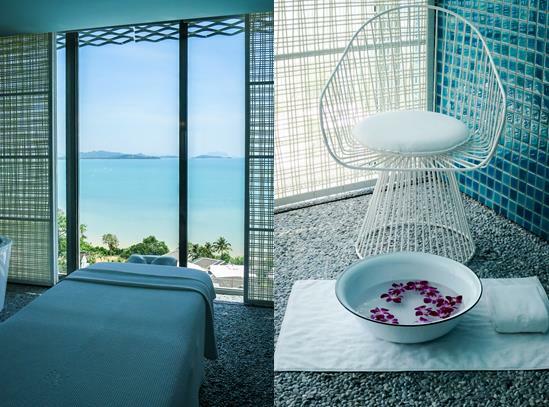 The super spoiling spa provides blissful treatments and a daily schedule of complimentary activities to further enhance your wellbeing - I was very impressed with the level of yoga on offer. As for the food, COMO’s ethos is that you can be as indulgent or as virtuous as you want. La Sirena, with its partially open-air dining room, offers a rather impressive breakfast buffet and each morning I feasted on fresh fruit, green juice and the freshest coconut water accompanied by stunning views - don’t worry, less healthy options are available too! For the rest of the day, there’s a huge range of sublime Italian dishes on offer (the wood fired pizza oven certainly got a lot of use) or you can choose delicious guilt free food from the light COMO Shambhala menu. Then there’s Nahmyaa, which serves the most amazing Peranaken Thai style food (a fusion of the best food from the area). It was here where I also learnt how to make a proper Pad Thai during a cookery class. In terms of activities, staying on this side of the island gives you easy access to what Phuket is (quite rightly) famous for, Phang Nga Bay, and sailing around the endless limestone karsts is a rather nice way to spend a day, maybe stopping off to visit James Bond Island (made famous in “The Man with the Golden Gun”) or discovering hidden lagoons. Old Phuket Town, with its Chinese-Portuguese heritage, is also definitely worth a visit. I’d previously poo-pooed it thinking it was run down, rather touristy and didn’t have much to offer. But, the old quarter is having a revival and I was bowled over at how lovely it is; many of the shop houses are being turned into cafés, guesthouses and cool boutiques and I was quite happy spending a few hours pottering around. There are also some great restaurants and, as it’s only about 20 minutes from Point Yamu, you can quite easily spend an evening there. As you’ve probably realised, due to its cliff top setting, Point Yamu doesn’t open out onto a beach. So, if relaxing around the 100m pool with its near-panoramic vista of the glistening sea isn’t enough, you can head over to the hotel’s new beach club (due to open in November). A mere 20 minutes by (complimentary) speedboat and you will have white sand between your toes and all the usual COMO touches such as a spa, healthy cuisine, pool and impeccable service. Back to my initial question - did I find what I was looking for? The answer is a resounding yes. The eastern side of Phuket is stunningly beautiful, with little development and definitely has a more authentic Thai feel to it with local villages, local people and very few tourists. As for Point Yamu, it’s a beautifully stylish resort with charming service and is perfect for those who appreciate an emphasis on spa and wellness balanced out with great food; a place to chill out and recharge your batteries. Yes, the lack of direct access to a beautiful beach won’t suit some but, I guess that’s the price you pay for seclusion and it certainly keeps the crowds away, whilst Point Yamu's other features certainly make up for it. Please note: Point Yamu accepts children and does get families at the weekend (they hop over from Bangkok, Hong Kong and Singapore). The hotel’s Play by COMO kids club is well away from the main public areas and has some great things to keep kids (and teenagers) occupied for hours. If you think your karma may be upset by little ones, I’d highly recommend the suites with private pools or even better the villas for absolute privacy and peace guaranteed. If you’d like more information of Point Yamu, a holiday to Phuket or Thailand in general then please do get in touch. Disclaimer: I was a guest of Point Yamu on this stay but, hopefully you will see this didn’t affect my thoughts on the property and I was already a fan of COMO Hotels before my visit. I was also a guest of Etihad Airways and on the return flight from Phuket (via Abu Dhabi) sampled their excellent Business Class Cabin which certainly gives Emirates a run for its money. The flight from Phuket also departs at a much more sensible time than the Emirates flight.